Miki Falls is a new four-volume manga series presenting the story of Miki Yoshida, a high school senior in Japan who meets Hiro Sakurai, a young man with mysterious supernatural powers. Kirkus Reviews declared it "stellar," The American Library Association placed it on their official list of best graphic novels for teens of 2007, and The Comics Buyers Guide called it "a brilliant new series by one of comicdom's best storytellers." 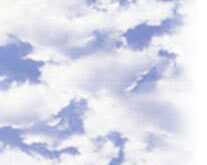 In 2008 Paramount and Brad Pitt's Plan B optioned Miki Falls for development as a feature film. This series of young reader novels is published under Random House's Delacorte Press imprint. It has become a mainstay in schools and libraries across the country and has been featured in USA Today, Nickelodeon Magazine, and on CNN Headline News. The first four books are an adaptation of issues 1-18 of the Akiko comic book series (details below), in which 4th grader Akiko is put in charge of a mission to rescue a kidnapped prince on the distant (and awfully strange) planet Smoo. There are significant differences between the comic book and children's book adaptation of the tale, however, so those who have already read one version will find a number of new scenes and characters in the other. The first four books in the Akiko series tell a single story. Ideally they should be read in the order shown here. In AKIKO ON THE PLANET SMOO, the first volume of the series, 4th grader Akiko is taken from Earth to the planet Smoo, where she is put in charge of a mission to rescue the kidnapped Prince Froptoppit. The saga continues with AKIKO IN THE SPRUBLY ISLANDS, in which Akiko and her Smoovian friends overcome a number of perilous obstacles on their way to the Sprubly Islands, where they enter into the wonderous miniature realm of Queen Pwip. AKIKO AND THE GREAT WALL OF TRUDD takes Akiko and her friends up and over the gargantuan Great Wall and onward into the realm of Alia Rellapor, where they come face to face with the dreaded Throck. In AKIKO IN THE CASTLE OF ALIA RELLAPOR, the concluding volume in the four-part story, Akiko is faced with shocking revelations as she struggles to understand the mystery behind the kidnapping of Prince Froptoppit. From the fifth book onward, all the stories are newly created for the children's book format and have no counterparts in the Akiko comic book series. They also stand alone, so they can be enjoyed in any sequence the reader chooses. In AKIKO AND THE INTERGALACTIC ZOO, Akiko and the gang encounter alien animals galore--and more danger than they bargained for--when they visit a zoo on planet Quilk. AKIKO AND THE ALPHA CENTAURI 5000 places our pig-tailed heroine in the driver's seat as she and her friends compete in a rocket ship race from one side of the universe to the other. Akiko and company visit Poog's homeland in AKIKO AND THE JOURNEY TO TOOG, where they soon find themselves caught up in a crisis that threatens the very future of the planet. Beginning with the eighth book in the series, AKIKO: THE TRAINING MASTER (due in stores February 8th), the book covers--and Akiko herself--got a whole new look . I will soon update this section to include the cover of my latest Akiko book, AKIKO: PIECES OF GAX. Sorry for the delay! Click here to visit the Akiko section of the Random House web site. My second series of young reader novels published under Random House's Delacorte Press imprint, the Billy Clikk series imagines a world in which monsters really do exist--right here on Earth. The reason ordinary folks don't know about them is simple: The monsters are kept at bay by the vigilance of a secret organization known as AFMEC, The Allied Forces for the Management of Extraterritorial Creatches. In BILLY CLIKK: CREATCH BATTLER, sixth grader Billy Clikk uncovers the existence of AFMEC, and--adventurous young man that he is--wants in on the action. His travels take him to India, where he sneaks out to battle a saber-toothed orf in the dead of night, only to find himself face to face with a foe even more sinister. Now an AFMEC Member-In-Training, Billy joins forces with fellow creatch battler Ana Garcia in BILLY CLIKK: ROGMASHER RAMPAGE. This time a secluded village in China provides the setting for a mission which pits Billy and Ana against beasts so huge and deadly they make the orf look like child's play by comparison. Look for it in 2005! 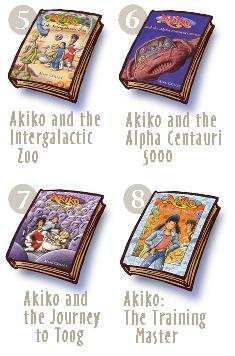 There are eight Akiko trade paperbacks, collecting issues 1 - 47 of the Akiko comic book series. The very first Akiko comic book story, AKIKO ON THE PLANET SMOO, is available as a special 40-page graphic novel with a durable cardstock cover. The epic story from the first eighteen issues of the Akiko comic book series is now available in three pocket sized trade paperback collections. This is the story from which the first four Random House children's books were adapted. AKIKO POCKET SIZE ONE: This first volume contains the very first Akiko comic book story, Akiko on the Planet Smoo as well as issues 1 - 7 of the Akiko comic book series: the first third of the Menace of Alia Rellapor saga. AKIKO POCKET SIZE TWO: This volume contains issues 8 through 13 of the Akiko comic book series, in which Akiko and the gang leave the Sprubly Islands and travel to within sight of Alia Rellapor's castle. Also included: a three-page back up story, The Story So Far. AKIKO POCKET SIZE THREE: This volume contains issues fourteen through eighteen of the Akiko comic book series, in which Akiko and the gang come face to face with Alia Rellapor and complete their mission. Also included: Market Day, a full-length story from issue 50, and a back-up feature from issue 52, Akiko at the Age of Eighty. The remaining Akiko graphic novel paperback collections are comic book sized. They each contain stand-alone material, and can be enjoyed in any order the reader chooses. 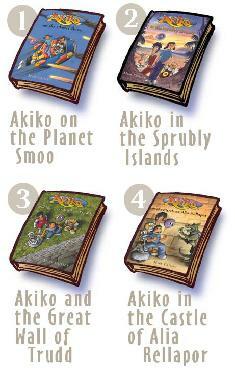 AKIKO VOLUME FOUR (issues 19-25) comprises a three-part tale entitled 'The Story Tree'. Mr. Beeba, Spuckler, and Gax take turns telling stories from their past lives, each spinning yarns filled with mystery and adventure. Beeba tells of his quest for the missing chapter from his most beloved book, "The Hemmin Spotter". Spuckler recounts his misadventures on the planet Brunk, where getting himself arrested was only the beginning. Gax tells of his tour of duty aboard a doomed space station, a story in which the entire cast is made up of robots. As a bonus, AKIKO VOLUME FOUR includes the "Poog Story", a visual saga with the only words being ones written in Toogolian! AKIKO VOLUME FIVE (issues 26-31) contains a single story, "Bornstone's Elixir". In this tale Akiko and the gang go in search of a magical potion which will save Mr. Beeba's ailing mentor, Professor Lunderdorf. Also along for the adventure is Prince Froptoppit, who learns a few hard lessons about life as he deals with his own feelings toward Akiko. AKIKO VOLUME SIX (issues 32-38) contains two separate story arcs. The first, "Stranded in Komura", recounts the cross-cultural confusion that ensues when Akiko and the gang crash land in rural Japan. Including passages written in Japanese (with subtitles, of course!) this story is truly unique among all of Akiko's adventures. The second tale, "Moonshopping", is the whimsical story of Akiko and her friends traveling to the Farflux Dimension in order to buy a new moon for the planet Smoo. Among other things, this story features Gax growing hair and Spuckler losing his mouth! A must for anyone who wants the complete Akiko comic book experience, AKIKO FLIGHTS OF FANCY collects fifty different strips, pin-ups, and assorted 'back-up' features that were published over the course of the first 46 issues of the series. Including issue #39 in its entirety (an unusual assortment of stories that occasionally interact with one another) this trade paperback represents my most experimental and creative work. Click here for an outstanding Akiko web page created and maintained by Johanna Draper-Carlson as part of her 'Comics Worth Reading' web site. Click here for an interview conducted by 'Ultrazine', an Italian online comics magazine.